What's growing on your desk? Adam - Antibiotic resistance is probably as old as the bacteria themselves. It's a tried and tested evolutionary strategy to produce these natural antibiotics which we use in medicine in order to give the bacteria that produced them a competitive advantage over their neighbours. Liam - So the majority of antibiotics we're using were first made by a bacteria? Adam - That's right, yeah. They're natural products which were discovered usually by analysing soil microbes - bacteria and fungi that live in the soil. Liam - So we're talking on evolutionary timescales. What's the oldest known record we have of antibiotic resistance then? Adam - I can recall a paper in Science a few years ago where they looked at 30 thousand year old permafrost and the bacteria that they analysed in that sample had resistance genes in their genomes, which were pretty similar to the ones that we find in clinical isolates today. Liam - How widespread are these antibiotic resistance genes - is it just limited to soil and permafrost? I mean, I'm in an office right now and my office doesn't have antibiotic resistance bacteria, does it? Adam - I think it probably would and we could test for that quite easily, actually. If I sent you some swabs and you swabbed whatever you want to in your office, your desk maybe or your computer keyboard and then send those back, we could grow all of the isolates that we can from those swabs and then we can test for both antibiotic production against a range of indicator strains we have. And we can also test whether the isolates from your swabs are resistant to a whole suite of different antibiotics. So you'll have a swab-off. Graihagh - So shall we label this so we've got it right? So this one's my desk right? Liam - Yes, Graihagh's desk. Liam - I should say my keyboards been used by a lot more people than just me. Graihagh - Yeah, yeah, yeah. Right which bit do you reckon? The space bars probably used the most, right? Liam - Yeah, the space bar, yeah. Because my keyboard was so disgusting, we took two samples to satisfy our curiosity. Graihagh - Ah, there's black stuff on it! Liam - Ah, that's probably just because I work so hard! All swabbed up - there was only one thing left to do. Who do you think is going to be the worst? Place your bets now! Adam - We're in a class two lab this morning so we've got to put the lab coats on and follow all the rules because we work with some quite interesting pathogens. Liam - Adam had taken our grubby swabs to see what he could grow on the equivalent of bacteria food, agar. And the results were, as expected, pretty grim! Adam - You can see here that on samples two, three, there's quite a lot of different bacteria. Liam - All three of the plates had grown a mass of furry stuff. One even looked like someone had sneezed on it. But, interestingly, no two swabs were alike despite the fact I swabbed the J key and the space bar of my keyboard. They're centimetres apart but entirely different bacterial colonies. Adam - So it just shows that the microbial diversity centimetres away from one area will be different in another. Liam - Adam then grows these colonies further, before putting them onto some more agar but this one contains antibiotics. So, if they grow here it means we have antibiotic resistant bacteria living on our keyboards! Adam - And you can see clearly here from swab number four, so this is your second keyboard swab. This is the one, which there was a lot of bacterial cells on it, but it all seemed to be the same thing. So that's growing on ampicillin really well. Liam - So there was antibiotic resistant bacteria on my keyboard? Adam - Yeah. So it's growing on ampicillin, it's growing on tetracycline, it's growing on kanamycin and it's also growing on chloramphenicol. Liam - So it's resistant to all those antibiotics? Adam - All four, yeah. So it's a multidrug resistant bacterial isolate. It's resistant profile is quite surprising. Liam - Oh, really? Surprising in a good way? Adam - Well... I wouldn't have expected something to grow on all four of those antibiotics. They're all different chemicals and they all have different activities, so to find something that grows on them all is unusual. Liam - Yikes! Where's the desk disinfectant? I fared pretty badly then, but what about Graihagh? Well, she didn't have any resistance but she did have bacteria that were killing off other bacterial nasties. Adam - The second isolate is producing something, pumping it into the agar, and that's preventing the Micrococcus from growing. Liam - Micrococcus is just a weak bacterium. It lives on our skin and does healthy people no harm. However, if Adam matched Graihagh's strain against something a little more lethal, how would it fare? Adam - We've got a multidrug resistant E.coli, and you can see that the very small zone of inhibition. Liam - So Graihagh's sample has something that appears to be killing multiple drug resistant E.coli? Adam - That's correct, yes. So what we really want is something that can kill exactly this type of bug because that's what's causing problems in the clinic, so it's really encouraging we find something like that. So it just shows how easy it is to find antibiotics pretty much anywhere in the environment. Whether they're new and useful for medicine, obviously will take many years of study to find out but, if we don't look, we won't find them. Chris - That was Adam Roberts there. And If you'd like to learn what's lurking where you live and work, you can get in touch with Adam via his website, SwabAndSend.co.uk... So can we get rich from your antibiotic-producing E.coli, Graihagh? Graihagh - Well, great minds think alike because I put this to Liam, and sadly not. It may have been growing on my keyboard but because Adam has discovered it, it belongs to him. Chris - So can we actually see what these bugs look like then? Graihagh - Yeah, it's pretty grimy. I've got some photos of the petri dishes here in which we've grown. These first two are Liams - they sort of look like yellow lichen on a petri dish, don't they? Chris - Yeah, lots of little blobs of bacterial colonies. Graihagh - Yummy! And then at my plate I've got something similar, this yellow lichen stuff but then I've also got this weird milky substance at the top corner. Chris - Some kind of mould isn't it, or something? Graihagh - Yeah, it doesn't look particularly nice. Chris - Swarming all over the place, nice! Graihagh - But what's particularly interesting is this last plate that Liam and Adam discussed. 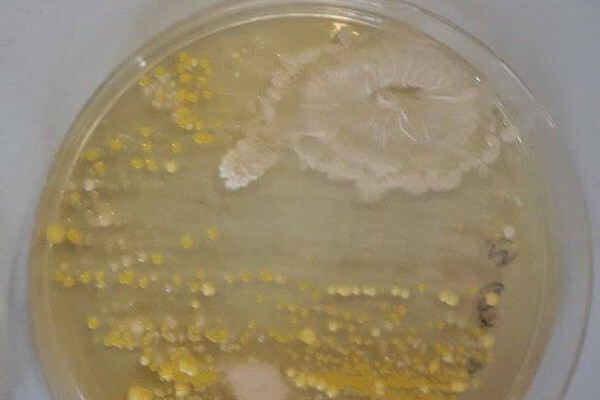 And this is a plate with bacteria already on it and we put that little E.coli-killing strain that was on my keyboard and we grew it. And what's really interesting you've got this crater, this white section and it's got this blast zone where it's killed everything around it. Chris - Yeah, so the bug colony from your desk is in the middle and there's nothing growing about a centimetre all round it. It's just killed off all the bugs. Graihagh - I know, it's pretty amazing, isn't it? I'm kind of glad to have that on my keyboard. Maybe I'm protected against E.coli now. Chris - Maybe we should share our keyboards and rotate them round the office. Graihagh - Well, you can see the pictures for yourself on facebook. Just head to facebook.com/thenakedscientists. Next How do antibiotics work? Why do some sexual practices disgust us?